Holt Engineering, Inc. has assembled a staff of professional engineers, licensed field technicians, and support staff to provide our clients with outstanding service and quality in materials testing and inspection services. Our technicians are highly experienced and NICET and ACI certified. We have a complete in-house laboratory for testing soils, rock and concrete materials. Our in-house laboratory is accredited in many of the required geotechnical and testing ASTM standards. Per AASHTO certification requirements, we participate in the AMRL and CCRL soil and concrete proficiency testing and inspection programs. 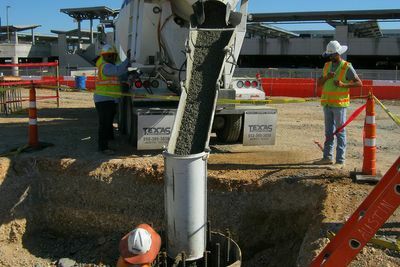 We are set up to perform Atterberg limits, sieve analyses, moisture density curves (proctors), oven dry moisture testing, permeability testing, unit weights, concrete mix designs, concrete compression testing, specific gravities, hydrometer testing, unconfined compression testing and asphalt density testing. Field testing services include concrete testing (slump, air content, yield and making cylinders, cubes, and/or beams), pier hole and beam excavation inspections (diameter of hole, beam size, depth, reinforcement, cleanliness and location), structural steel and reinforced steel inspection for both above grade iron structures and below grade steel piping, wood truss inspection, post tension cable stressing, fire-proofing and other services as needed per the project testing specifications. Windsor probe concrete testing is used as a non-destructive test method to test compression strength of the actual hardened concrete in a structure. Pier inspection includes verifying location, pier hole diameter, depth of hole, embedment, reinforcement cages, groundwater, plumbness and cleanliness of hole, tremmie length, casing and concrete testing. Concrete testing and inspection in the field includes noting the properties of fresh concrete such as temperature, slump and air content, verifying mix design, concrete supplier and location of concrete being placed. Cylinders or cubes made in the field are broken at a later time in order to determine compressive strength. 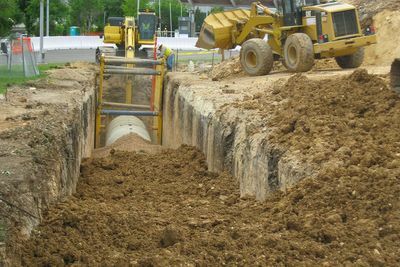 Utility backfill inspections include visual observation of trenches, placement of pipe bedding material, placement of pipe and trench backfill compaction and density testing. 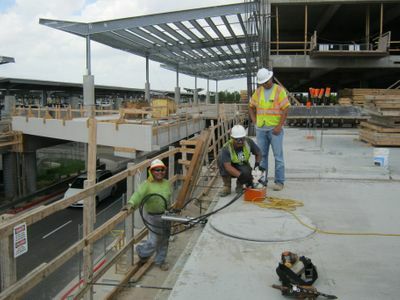 The goal of reinforced steel inspection is to ensure compliance with the project plans and specifications for many types of structures including slabs, bridges, columns and roadways. The reinforced steel bars are inspected for diameter, shape, grade, spacing, stirrups, tie spacing and chair supports. 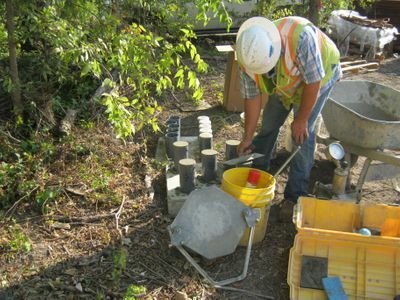 Asphalt testing includes obtaining grab samples from the batch during each day’s placement or as specified in the plans. Bag samples will be transported to an outside accredited lab for testing extraction, gradation, specific gravity and HVEEM stability. Our firm will cut cores within the following week and verify thickness and bulk specific gravity.